Hidden away in this slice of paradise is a restaurant lending a hand. Heidi Erwig, chef and owner at Heidi’s Honeymoon Grill, has been serving up meals to residents of Water Island and visitors for 19 years. When she heard some of her usuals weren’t getting paid because of the government shutdown, she stepped in. The only way she knew how. “Coast guard is a big thing for us. I mean, we live on a small island, which is surrounded by water. We really count on the coast guard a lot. It’s not fair that they’re working for no money. So we just wanted to help out and do whatever we could,” Erwig said. Heidi decided to offer free meals to members of the Coast Guard every Saturday during the government shutdown. Her Water Island restaurant is located right on the beach. Easy access for the Coast Guard crew pulling up for a fresh meal. “Heidi’s Honeymoon Grill. After the hurricanes, Irma, we had a bunch of linemen come down here from New York and Heidi fed ‘em all. I don’t know how she did it. Same thing here,” Larry “Doc” Oliver, a resident of Water Island said. Locals said, if there is someone in need, Heidi is the first one helping. She not only helped the Coast Guard during the shutdown, but she took pizzas over to TSA workers. Never asking for anything in return. “Heidi is an angel and that’s what angels do. That’s all I got to say,” another Water Island resident Kevin Butler said. Heidi will continue doing for as long as she needs to make sure everyone has food on the table. “We’ll keep helping them out, they help us out,” Heidi said. 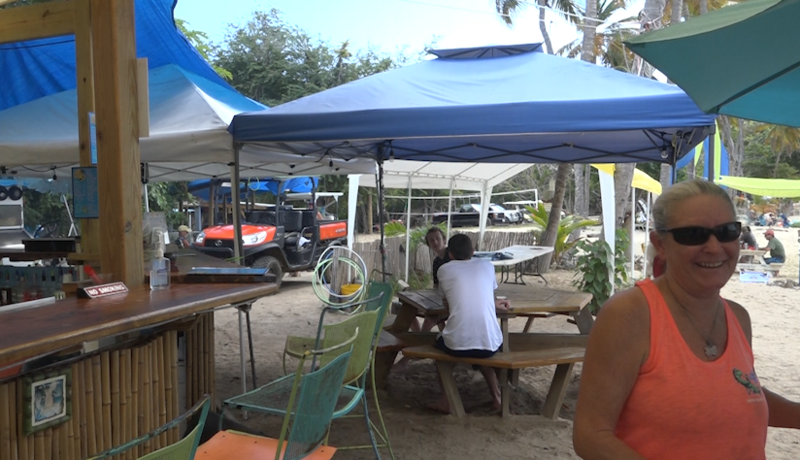 Heidi’s service to Coast Guard members with ID continues this weekend from 11am-3pm at her restaurant on Water Island.